Pegasus F C team about to take the field to play Stevenage Town in the second round proper of the Amateur Cup 1953/1954 season. Stevenage lost a very good game 5-2. In the previous Town had beaten another famous old team Corinthian-Casuals. My step- father, Fred Taplin took this photograph, plus others, unbeknowst to me. Did Pegasus become a well known team? 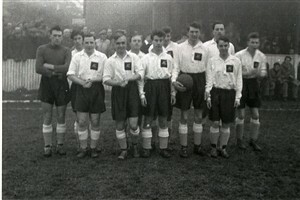 Pegasus were a crack amateur side of the early 1950s, and actually won the FA Amateur Cup twice. They comprised players who were also studying at either Oxford or Cambridge university. I saw Pegasus in both the finals, at Wembley, and still have a programme for one of the games. Hope this information is of interest.